Cleveland-based Iron Chef winner Michael Symon was quoted in a 2009 Food Network Magazine article calling the Mo-Fo the best thing he’d ever eaten. Click the pic to check out the Burger Guyz review of Ray’s Place and the Mo-Fo burger! 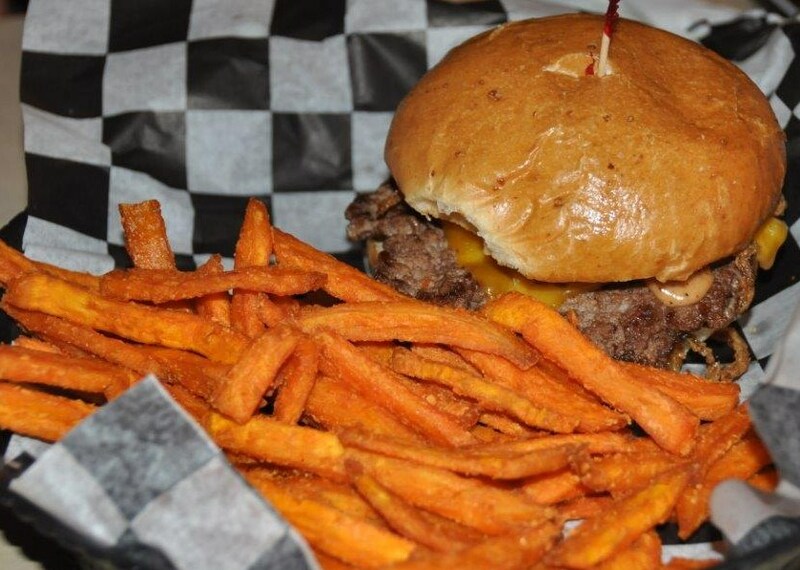 In it’s tireless search to find the perfect burger, the ACBG made its last stop of 2013 at Ido Bar and Grill. Serving burgers since 1943, Ido sits on the western edge of Akron’s Firestone Park neighborhood. I suspect that its heyday passed when the smell of rubber disappeared from the air. However, it obviously has something going for it as its doors remain open. All day Wednesdays, “Ido” burgers are ½ priced with the purchase of a beverage. This reduces their signature “The Famous Ido Burger” with grilled onions, mushrooms and American cheese to a mere $3.99. With 10 burger selections plus a build your own option, everybody can get a burger here. Don’t worry if you want a burger but your companion does not. Their menu also provides familiar air, land and sea choices. As far as the groups burger choices, I ordered the signature Ido, others ordered the Fried Pickle Burger, Blue Cheese Burger, and a Bacon Ranch Burger. None of us offered, nor were we asked to what degree of doneness we preferred our burgers. When they arrived, we discovered them to be well done but still juicy. 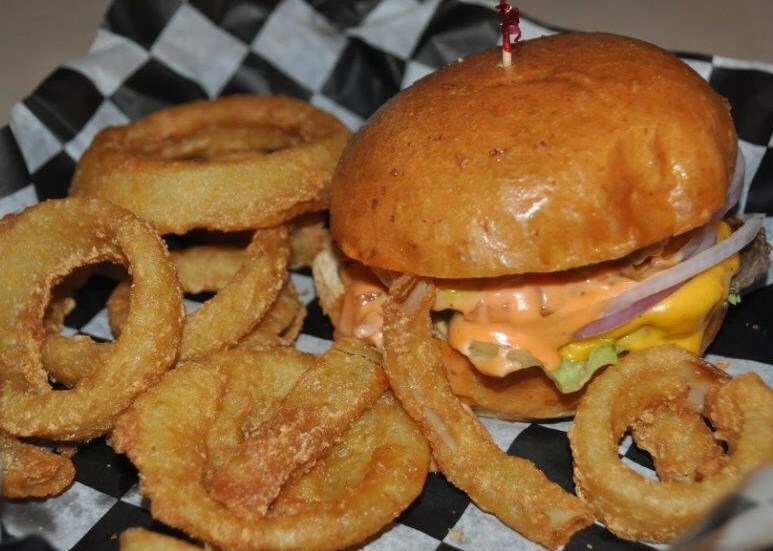 The hand-pattied burgers and sides (fries and onion rings) arrived hot. Presentation was typical and on a real dinner plate. My Ido came dressed with a toothpick holding its crown on top of a pile of grilled onions and mushrooms and a stack of onion rings sitting comfortable next to it. The Ido has a very mild flavor and no particular seasoning was noticed. The other guyz’ burgers had more flavorful toppings such as the Fried Pickle Burger. Rich commented about how it had similarities to the well-known “Big Boy”. Steve’s Bacon Ranch Burger came loaded with bacon! One thing the guyz found was that the bun, while big enough for the patty and toppings, quickly became mushy and fell apart. None of us left hungry. Ido Bar and Grill is a clean, inviting place to stop for a meal. Ido has an average burger at a price that’s hard to beat. The staff is second to none. From the minute we walked in until the time we left, we were treated like old friends. Our server, who we learned hails from France (we don’t know her name, but want her to know we’re writing about her), is just as nice and efficient as they come! The ACBGz weigh in on the burgers at Pub Bricco. Click the pic to check it out! The Akron-Canton Burgerguyz paid a visit to Menches Brothers in Green which is a few minutes south of Akron just off of I-77. Menches Brothers has had several of their 50 burgers ranked in Akron’s National Burger Festival. But, it appears that they use the term “burger” loosely, as some of their 50 selections had what we would call “non-burger” items which included pulled pork. We feel that, just because it comes on a bun, it isn’t automatically qualified to be a burger. Anyway, we chose “real” burgers; that is, ones that featured hand shaped beef patties. The burger sizes ranged from 1/3 to ½ lb. Number 10 – Menches 1000 : A beef hamburger with “Melted American cheese, onion, lettuce, pickle, & creamy Thousand Island dressing”. It is further captioned on their menu as “The Big What??”. Number 16 – The Crispy Onion Burger – “Crispy fried onions, Wisconsin Cheddar, smoked bacon, and our very own Big Mench Sauce”. Number 21 – The Bobbalouie – A “double burger topped with American and Cheddar, fresh sautéed mushrooms and onion, smoked bacon, & our Big Mench Sauce”. The Bobbalouie was the #1 burger at the 2006 Akron Burger Festival. Our service was friendly and unhurried. The unhurriedness occasionally seemed to turn into long waits. Our orders were taken and accurately prepared. However, none of us were asked how we preferred the doneness of the meat. Our burgers arrived well done and somewhat dry. The presentation was average; wax paper lined plastic baskets with the hamburgers dressed and wearing their crowns. Everybody agreed that the bun was solid and held up to the last bite. However, we felt that the bun was too tall for the single burger but decent for the double burgered Bobbaloui. Nobody was really impressed with their toppings. The Menches 1000, purporting to be a “Big what? ?” (get it?) delivered a lame flavor, other than the pickle slices, that resembled nothing what it suggests itself to be and sans sesame seed bun– this coming from a fast food Big ^^ac fanatic. The other burgers with the “Menche Sauce” were whelming eaters with a strong pepper flavor. Nobody said anything about the sweet potato fries and the order of onion rings were nothing special. Perhaps something about the Bobbalouie changed since 2006. Perhaps, well, we could keep guessing…. None of us disagreed, that if we were in the area looking for something to eat, that we would return. The food was not bad by any means. It was just not what we expected. However, for any of us that do return, there are 47 other “burgers” to try. This is in addition to a full menu and full bar. 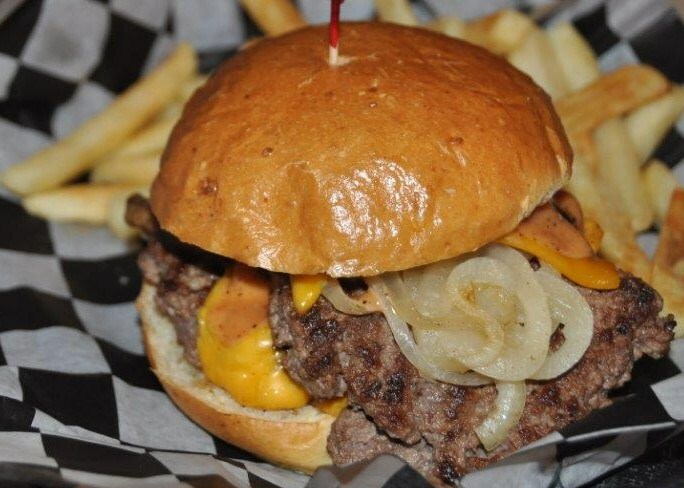 If you know who flips a great burger in the Akron/Canton area, we want to check it out! Email us at burgerguyz@hotmail.com or friend us on Facebook: Akron-Canton Burger Guyz.